As I sat on the floor of the Burlingame Public Library surrounded by children and their parents anxiously awaiting to hear from the illusive Lemony Snicket, I suddenly realized that I did not have a clue what he actually looked like. Yes, like everyone else, I had heard of and read some of his notorious books, A Series of Unfortunate Events, and I even saw the movie adaptation but I had never actually known what Mr. Snicket looked like. This realization began to make me just as anxious as the hordes of children lining the library. Then finally the moment came and the library director announced that the reading was about to start, but she only introduced the illustrator of Snicket’s newest children’s book, The Dark. Jon Klassen, the artist of this book, made his way onto the stage and looked slightly nervous. He began to profusely apologize that Lemony Snicket was running a little late and he would have to wing it until he arrived. I must admit, I was a little thrown off by an author being late to his own reading, so I zoned out a little bit in the beginning. But suddenly, the sound of laughing children snapped me back to reality. There was a strange man dressed in a grey suit wandering towards the front of the stage. He took one of the microphones that was up front and told the children that Lemony Snicket would not be arriving, that he certainly was not Snicket. This only made it obvious that he was, of course. I found it charming that he had planned to play this small trick on the audience; it made the reading more entertaining overall. Snicket continued to play to the crowd by walking through the children while he spoke and even having one child hold his leg while he explained something. Snicket and Klassen prepared a slide show of both of their lives and what inspired them to write and draw, about which Klassen was very enthusiastic. Snicket proceeded to mock Klassen’s childhood photos, the first being a picture of Klassen on the swings as a young boy. Snicket responded to this photo by saying dryly, “swings are a waste of time.” He was almost like a stand-up comedian strolling through the eager faces of children hanging on every funny word he said. Lemony Snicket then read his entire children’s book The Dark to the audience and, to make it more entertaining, he forced Klassen to recreate every page he read aloud in drawings. Klassen was posted at a children’s easel, frantically attempting to draw while Snicket read from the book. Snicket was blatantly rude to Klassen, while he softly spoke back — but it was all in good fun. At times, while no one else was watching Klassen, I could see a big smile come across his face. Snicket then took the drawing to the next level when he blindfolded Klassen. This just made the kids laugh harder. Klassen being blindfolded allowed Snicket to be extra sneaky and hilarious. In the earlier slide show, a picture of a crab popped up and Snicket screamed upon seeing it. He then told the audience that Snicket, not him of course because he was not Lemony Snicket after all, was deathly afraid of crabs. This made the very last moment of the reading priceless. For the very last page that Snicket read, Klassen rebelled and began to draw a big crab instead of whatever the page called for. Snicket, who was engrossed in reading, did not see this crab and it made for a wonderful moment for the kids. They laughed and yelled, attempting to warn Snicket. When he finally turned to face the easel, he screamed bloody murder and ran out of the library with his hands over his head. It was the perfect ending to a strange, yet wonderful children’s reading. Lemony Snicket and Jon Klassen prepared a great reading for the children of the Burlingame Public Library that was filled with imagination and spirit. I have always enjoyed writers, and even adults, that nurture their inner child and are not afraid to act silly sometimes. It is an amazing lesson to teach children to laugh at themselves from time to time. 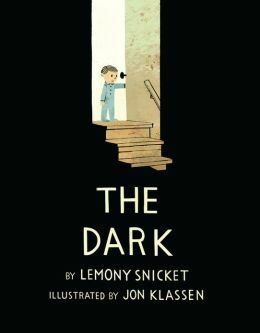 Plus, the book, The Dark, is about a young boy who conquers his fear of the dark so Snicket breaks barriers all around. If you are looking for a creative and fun reading to take your children to, Lemony Snicket is your guy. Hilariously, you can listen to Neil Gaiman read a clip from the book here. Erica Arvanitis is a Litseen intern and a senior at SFSU for Creative Writing. She is originally from San Diego and enjoys writing short stories, eating burritos, and watching TV in her free time. She hopes to write professionally for a magazine when she grows up — any magazine will do.